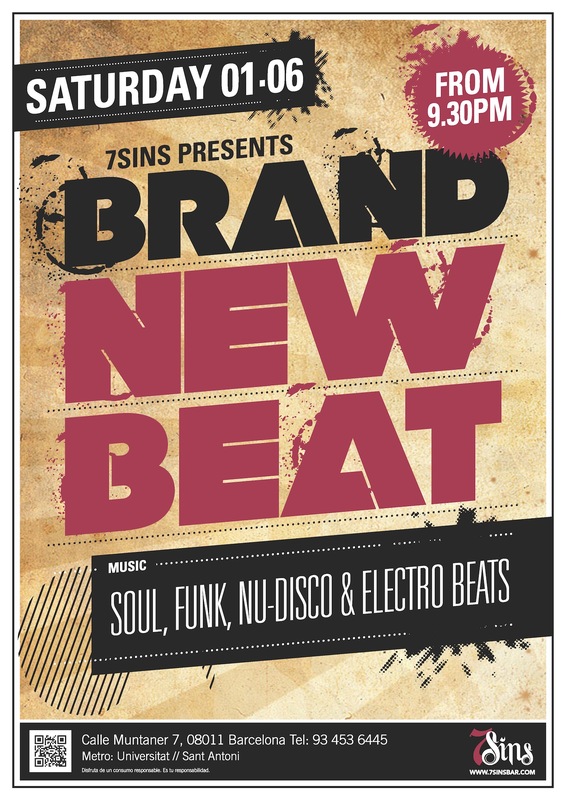 Brand New Beat is back at 7 Sins in Barcelona on Friday 4th April for a special spring festival of funk! We’ve got the usual resident DJs but also a super special guest all the way from the UK. ‘Hank Champagne’ (Bodywork) will be spinning an all-vinyl set of disco/house/afro and edits to bring amazing tunes to the Barna crowd. The usual mix of funky soul early on will merge into eclectic breaks and electro beats. There will be well priced drinks with special offers before 23:30. Get 5 bottles of Heineken 10 EURO, Pints of Estrella 3,50 EURO and Bottles of AKDamm 1,50 EURO. There’s also good burgers and bar food, so why not come down early and make a night of it. As always it’s free to get in. Get there early to make the most of the collaboration with BNB & Bodywork (www.facebook.com/bodywork.bristol)! We hope that you had a great end of 2013 and here’s to an even better 2014. Watch this space for further developments and more of the classic BNB events for the new year. We’re back at 7 Sins again but this time it’s a Saturday night! Yes, it’s going to be another great night of funky soul, hip-hop breaks, nu-disco and electro beats with the Brand New Beat Barcelona resident DJs. Come down from 21:30 until 03:00 and take advantage of the free entry all evening and good prices on drinks. Yes it’s Saturday night and yes, it’s all good for dancin’! After May’s great night at 7 Sins, Brand New Beat is pleased to present another classic club night of dancing, drinking and DJing. Yet again we will be dropping an eclectic mix of upbeat soul and funk, followed by hip-hop, nu-disco and electro beats, so come down in your dancing shoes. We’re looking forward to seeing you all down there to celebrate the first weekend of June. Here’s hoping that it’s actually going to be summer by then and so everyone will be up for having a bit of a dance on a Saturday night!